“The Cross was on a Church building, where else should it be? Why have we become so intolerant, so sensitive? Be fair and rational #Malaysiaku,” said user @amirfareedrahim. “Looks like Malaysia is going to fall real soon. Can’t even have a church in Taman Medan. Umm… No freedom,” added ‏@JustinDeLalaKid. “After meeting with the priest, the church agreed to take down the cross by next Sunday. If they have the authority to run, we cannot stop it,” Abdullah was quoted as saying. “Cara tegakkan Islam ialah dgn bijaksana, pengajaran baik & debat/dialog terbaik (an Nahl 125). Bukan dgn turunkn salib d gereja,” he said. “It is a sad day indeed when Muslims start believing that inanimate objects have power over them,” she tweeted. “Just read about the church’s cross taken down. Man, is the cross affect your solid faith?,” said @nasiruddinayup. 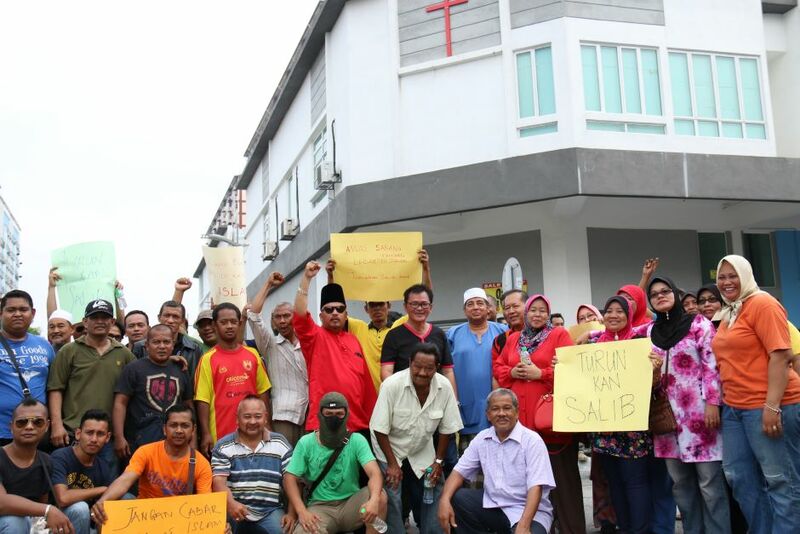 “Full respect towards the priest of Taman Medan church in the patience and tolerance of handling the stupidity of the Meleis residence there,” said ‏@JeasonJilan. “I feel obliged to explain the situation as the actions of the PJS Umno members have caused negative perception towards Islam and the Muslims especially. “Umno, once again, uses Islam for its narrow political agenda and racism,” she said in a statement today. “After investigations, the individuals present have links to PJS Umno, whether they have had posts before or still are holding posts in the branch/division, Youth or Women,” the PKR lawmaker added. “In fact, the extreme action has given a negative perception towards Islam and Muslims. Now, Muslims are seen as obsessed and extreme by stopping non-Muslims from practising their respective religions. “Islam teaches its followers to treat those of other faiths well so that Islam is not attacked. Surah Al-kaafirun clearly states that each to his own religion and Islam will not be forced on others. “I advise those who are involved in the protest of the Taman Medan church to go back to the real teachings of Islam that was brought by the Prophet Muhammad and leave any action that is against the teachings of the religion,” she said.